Add your favorite hanging ornament or a small feeder to the outside of your window using this Droll Yankees Stainless Steel Window Hook. 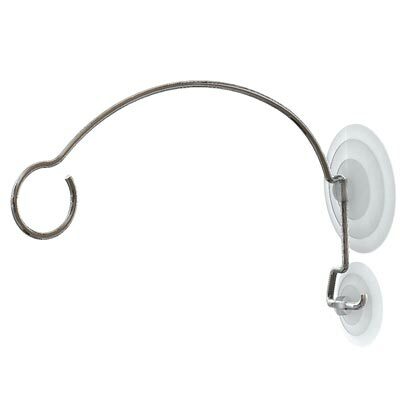 This fantastic, stainless steel hanger perfectly showcases small feeders or other items up to 14" in diameter. Its two, generous suction cups securely affix the item to your window, and the hanger end curls inward to keep the adornment in place. The stainless steel body resists rust and corrosion, and the arched design offers plenty of display area. Showcase a hanging adornment from your window with this Stainless Steel Window Hook. Capacity: up to 4 lbs.